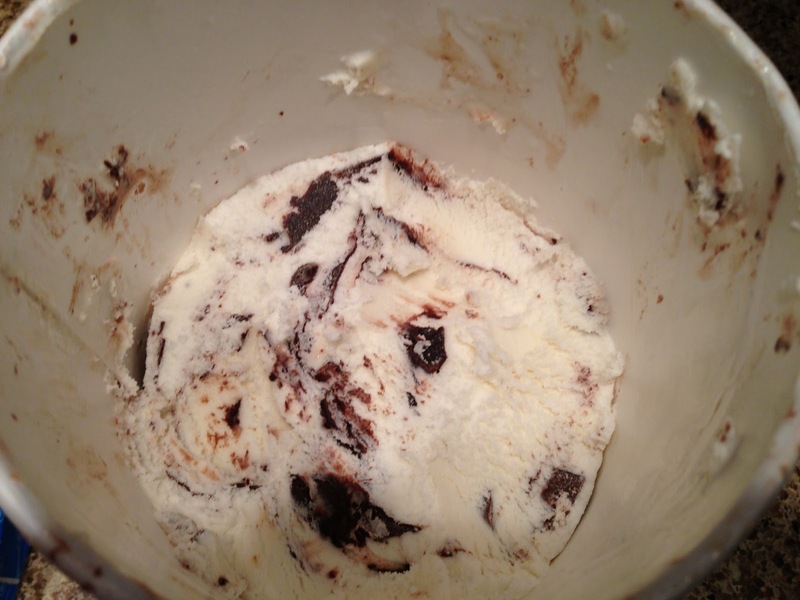 If you really look at it, Moose Tracks is kind of like vanilla or chocolate in the ice cream world. It's a flavor combination created by Denali that is licensed out to ice cream manufacturers to make under their own label. 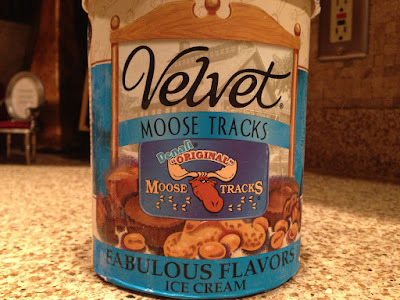 I've looked at other versions of Moose Tracks before, but never one from Velvet Ice Cream Company based out of Ohio. In my previous Velvet review, I had my socks knocked off by how awesome their Buckeye Classic flavor was, so despite the fact that Moose Tracks is sort of a generic flavor, I had high expectations heading into this review of the 1.75 quart container of this Velvet Ice Cream Company Denali Moose Tracks Ice Cream. My mom picked this one up, so I actually didn't pay for it (or eat it at my house as the different picture background above indicates), but I can tell you that I have seen this in Kroger for roughly $5.99 for the container. Since this is two scoops/servings bigger than the typical ice cream container, I can tell you that this one had fourteen half-cup servings at 190 calories per serving. The basic recipe for Denali Moose Tracks ice cream is a vanilla ice cream base that is then mixed with a thick fudge swirl (Denali says that it is their "famous" fudge) and also peanut butter cups. Despite the fact that my mom, her husband and myself wolfed down half of this container before I could snap a picture, I can confirm that the fudge and peanut butter cups were amply spread throughout the container. In fact, I've got to say that I was impressed with the amount of fudge in here as it was much larger than some of the other Moose Tracks mixes I've had from other manufacturers. So, before I even tasted this, I can tell you that Velvet wins on presentation. They win on taste too. While this is basically what you'd expect based on what flavors are included, it is that surety in flavor delivery that makes this a good one. While the vanilla ice cream was kind of flat and bland, the fudge was thick and decadent. The peanut butter cups were also perfect as they brought even more thick chocolate and sweet peanut butter to the mix. I would almost go so far as to say that the flat vanilla ice cream, which was fairly creamy by the way, actually helped this out because between the fudge and the peanut butter cups, this could have gotten far too rich had the vanilla ice cream been sweet as well. Instead, its flatness kind of balanced everything out and while this was sweet, it wasn't overly sweet. The fudge had hardened in the container, so it wasn't gooey at all and brought some crunch to the soft ice cream. The hardened peanut butter cups also did the same thing, so having those crunchy components in this container was something that I truly appreciated as like I've said many times before on the blog, I'm a total crunchy mix-in guy when it comes to my ice creams. Buy It or Fly By It? If you like fudge and peanut butter and don't want to eat anything too crazy, this is the perfect container for you and deserves a BUY IT rating. 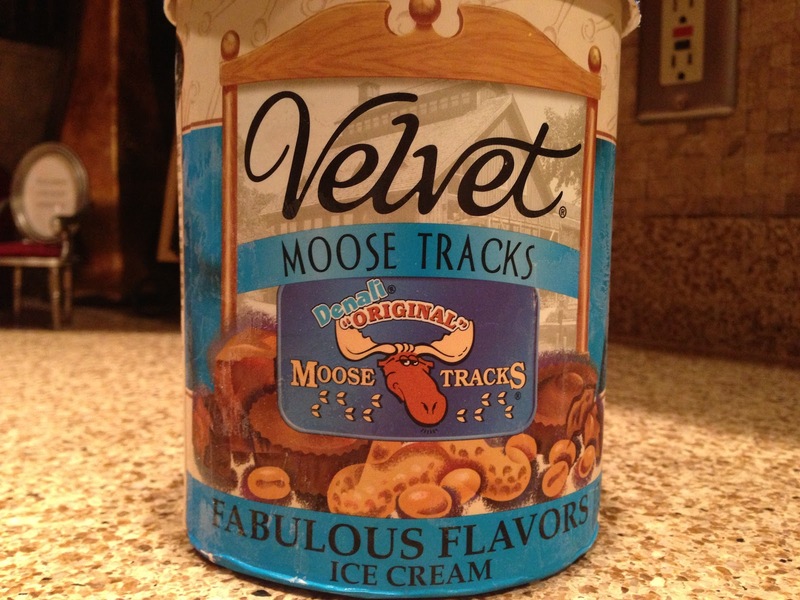 It can get a bit expensive at its normal price, but when on sale, this is a very solid of the Denali Moose Tracks recipe and I think they'd be proud of how well Velvet Ice Cream Company did in constructing it. I know I was impressed and found their execution of such a basic recipe to be quite tasty.